Teleradiology service companies have become an accepted part of the image-reading landscape in the United States, with general estimates suggesting that about half of U.S. radiology practices use their services. Although the relationship between teleradiology companies, hospitals and radiology centers continues to evolve, there is no doubt that teleradiology is a useful service for many institutions. When a hospital considers utilizing a teleradiology service, it typically finds that there are many from which to choose. In addition, there are many factors to take into account in order to assess which one will best fit an individual hospital’s needs. To provide some insight into how to make a decision, Imaging Technology News surveyed several teleradiology companies to ask for their advice. Following are highlights of their comments. Most of those surveyed were in agreement that a teleradiologist should be available 24/7, not just to do readings, but also to answer questions, if needed for clarification. “At some point, the needs of the hospital could change and [it will] need many services from its provider,” Couples said. As might be expected, information technology (IT) factors are critical in choosing a provider. In addition, the quality of the radiologists is paramount. Vijay Vonguru, president of Vesta Solutions in Lake Mary, Fla., said a hospital should evaluate the credentials of the reading radiologists. Cruz said that having a pool of radiologists that can offer a variety of subspecialties for reads is another consideration. Since the very nature of teleradiology brings with it the possibility of being based anywhere in the world, a discussion of the pros and cons of foreign versus domestic reads comes into play in choosing a provider. Our survey participants all shared their views. When it comes to utilizing teleradiology services, a hospital should evaluate its own capabilities in certain areas to ensure success. There are factors that require coordination and capabilities from both the provider and the client. For example, both parties must keep in mind the need for privacy and security with regard to patient data. It also is important to evaluate the capabilities for backing up data, as well as what will happen if/when service interruptions occur, such as when Internet, drives, software or phone lines go down. Integration of the teleradiology group’s hospital information system (HIS), RIS, electronic medical records (EMRs) and PACS systems with the hospital’s is essential. Cruz added one thought in this area. - Ryan Pahler, Online Radiology Medical Goup — There is a move toward total coverage or a hybrid solution. Many hospitals are looking to consolidate the number of contracts that need to be managed and want to find one provider that can offer all services. - Amy Cruz, Imaging On Call LLC — First, onsite services: The trend of teleradiology companies providing onsite services to hospitals has been on the rise. The radiology groups contracted with the hospitals have expressed concern over these teleradiology providers taking over the actual contract and displacing the group. Contracting with a vendor that has made a commitment against these predatory practices is common. Second, development of mega-groups: There is an increasing belief that groups will begin to merge so they can scale and provide the additional services in-house vs. outsourcing to a teleradiology provider. Third, reimbursement: Reimbursement rates continue to decline. This makes for a more and more competitive environment. This market competition has caused traditional practices and teleradiology practices to evaluate their own businesses and make sure they can be profitable at their core competency. - Vijay Vonguru, Vesta Solutions — We see some more hospitals turning towards final reads to cut down costs. There is also a trend towards reducing Locums and using telerad groups in their place. Finally, there will be pressure on small rad groups to merge with telerad groups, as the hospitals look for more subspecialties. - Kerry Couples, Nighthawk Radiology Services — 1) Final reports instead of a preliminary report to the emergency room; 2) Small telerad companies/large radiology groups utilizing teleradiology to secure hospital contracts. - Sunita Maneshwari, Teleradiology Solutions — More need for stat finals and day stats. Read the related article "Teleradiology 3.0: Transitioning to Distributed Radiology." 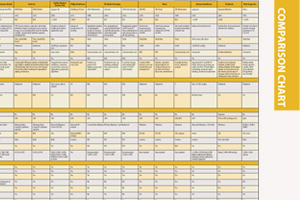 Compare services between teleradiology companies in the Teleradiology Comparison Chart - www.itnonline.com/content/teleradiology-services. Access will require a login, but it is free and only takes a minute to complete the form.